Why shave when you can make your own sugar wax right at home? Today we’ll show you how to make sugar wax at home in just a few easy steps! Long gone are the days of shaving (or at least they should be)! Shaving causes ingrown hairs, razor bumps, and irritated skin. Not only that, but shaving only lasts a couple of days, and by the end of the year, you’ll have spent hundreds of dollars on razors and shaving cream. I think we can find much better ways to spend our money! The great thing about sugar wax is that it’s so much better for your skin than shaving or waxing. It’s all natural, and doesn’t rip the hairs or cause bumps or irritation. Sugar wax is also a much gentler way of removing hair, and doesn’t hurt nearly as much as waxing. Oh, and did we mention how cheap it is to make your own sugar wax? Because the only ingredients you need are sugar, water, and lemon juice – could I get an amen?! 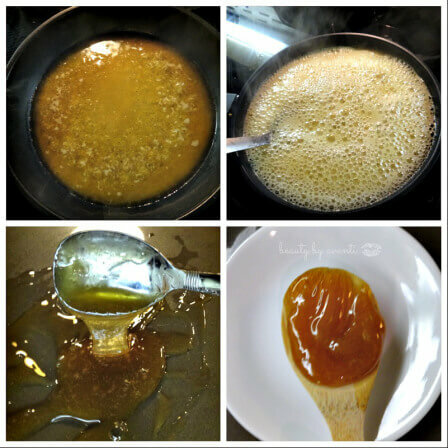 So let’s check out how to make sugar wax at home with this DIY sugar wax recipe! As you can see, the ingredients are all 100% natural and you probably already have them in your kitchen. Plus, imagine the amount of money you’ll be saving!!! This DIY sugar wax recipe is super easy to make, but just be careful not to burn yourself. If possible, have a friend or family member give you a hand! In a medium sized pot, add all of the ingredients and mix them with a wooden spoon. Place the pot over high heat, and wait until the mixture becomes bubbly/frothy. Reduce to medium heat, and stir constantly. It’s extremely important that you stir, stir, stir, otherwise the mixture will harden and you’ll have to start over again. Cook on medium heat while stirring constantly until mixture reaches a medium golden brown color. This should take about 5-10 minutes. Remove the pot from heat and let sit for 5 minutes. Meanwhile, take a spoonful of the sugar wax mixture and place it in the fridge. Allow it to cool, and if the consistency still isn’t right, return the mixture to heat. The consistency should be a thick, manageable consistency (you should be able to pick it up….just like wax). Allow to cool at least 30 minutes. Once cooled, transfer to a bowl. Using a wooden spoon, spatula, or even your hands, grab a small amount of the sugar wax from the bowl, and roll between your hands, forming a ball. Press the ball down to flatten onto the area you want waxed. The sugar wax should be on your skin about 1/4″ thick. You can also use waxing strips, by pressing the wax onto the skin, and then placing the wax strips on top of the wax. Then, rub the strips back and forth to create some friction. Take a deep breath, pick up the end of the wax, and pull fast and in one motion AGAINST the direction which your hair grows. 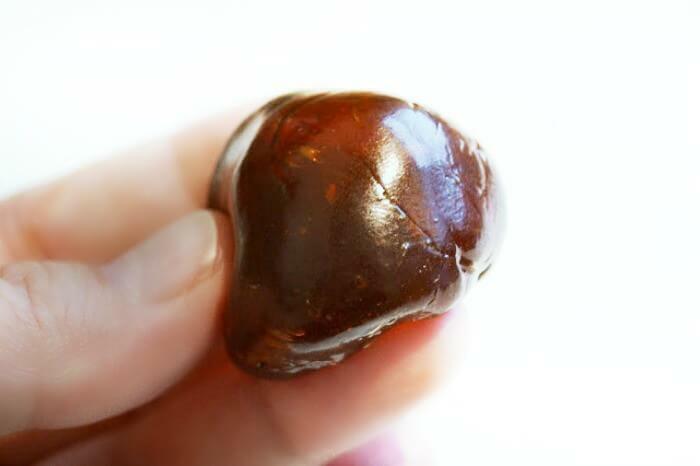 You can reuse the same wax piece 3-4 times until you should make a new ball. The wax can be used on any part of the body, including bikini, underarms, upper lip, and legs. Sugar waxing should last a few weeks, depending on how fast your hair grows. It’s important to do a little prepping BEFORE you wax to get the skin nice and ready! Use a homemade sugar scrub to exfoliate the skin, specifically on the areas you are planning on waxing. Do this in the shower and use a loofah or a washcloth to massage the scrub onto wet skin in slow, circular motions. This will exfoliate the skin, meaning it will get rid of dead skin cells, dirt, and impurities, which will make waxing that much easier. After exfoliating, dry the skin really, really well and do not start waxing until you are 100% your skin is dry. Liberally sprinkle a small amount of baby powder onto skin before waxing. This will absorb any moisture and make the process easier as the wax will be able to pick up hair much more easily. Make sure you test a small area on your arm before beginning to ensure you don’t have any adverse reactions to any of the ingredients. If you’re not confident in doing this alone, have a friend give you a hand! Remember to let the sugar wax cool before applying it to skin. This is not like hot wax, and therefore needs be to cooled completely before using. You said to let wax cool so it doesn’t need to be hot or warm for the actual act of waxing? this comment kind of confused me. If it doesn’t need to be heated then why does it need to be cooled at all, since it’s not hot or even warm? If you read the instructions, the sugar wax does need to be heated up first in order to become malleable and form its shape. But you need to let it cool completely before actually using it. Does it have to be white sugar,or can it be brown? Dose it need to be fresh lemon juice, and can you save the mixture to use at a later time?